The original Cook of Cook & Radley was Valentine Cook (1824-1897). His death notice in the New York Times, 11 Dec. 1897, read in part, "Valentine Cook, the iron founder, of 212 East Thirty-seventh Street, died Thursday. Mr. Cook was born in Bavaria, Germany, Feb. 21, 1824. His name originally was Koch, but he changed the spelling soon after he came to America, with his father, in 1836. After serving an apprenticeship under James C. Freeman, a founder, he started in business for himself, and succeeded. He later was the head of the firm of Cook & Radley for twenty years. This firm was dissolved in 1889, and Mr. Cook conducted the business alone until he took his son Martin in partnership. The firm was styled C. Valentine Cook & Son at the time of his death." The reference to the company name in 1897 should read Valentine Cook & Son. The Radley of Cook & Radley was John B. Radley (1820/21-1890). Radley received only a brief notice at the time of his death: "Radley - At his residence, Mount Vernon, on Friday, Feb. 21, of paralysis, John B. Radley, in the 69th year of his age. Notice of funeral hereafter." (New York Times, 22 Feb. 1890, p. 5)." According to information provided by his son, John J. Radley, when applying for a passport in 1922, John B. Radley was born in Alsace, France, and immigrated to the U. S. in 1847. Valentine Cook was listed as a blacksmith in Trow's 1852-53 New York City Directory, then in 1856 as a partner at "Cook & Co. iron," at 96 W. 35th St. The other Cook at Cook & Co. was Joseph Cook, who may have been a brother. In 1857 the company was called "Cook & Brother." However, the only information I have been able to find on Joseph Cook is an entry in the 1870 U. S. Census, where he was 54 years old and born in Prussia. Valentine Cook's census records give Bavaria as place of birth. Another Cook at Cook & Brother was Francis Cook. He was listed in the 1860 U. S. Census living two dwelling houses away from Valentine Cook. His age was 30 and he was born in Bavaria. He seems a more likely brother to Valentine Cook than Joseph. (For more on Francis Cook and Joseph Cook, see the F. Cook Iron Works page.) This combination of Cooks seems to have stayed together in the iron business until the mid-1860s, which is when Cook & Radley was formed. John B. Radley first appears in New York city directories in 1856, by which time he was probably a member of the firm Cameron, Johnson & Radley at 215 Grand St. In 1859 an ad reading "Eagle Iron Works / Cameron, Johnson & Radley / 215 & 217 Grand Street, and 91 Elizabeth Street, / Railings, Balconies, Verandas, Doors, Shutters, Sky-Lights, Vault-Lights, &c., / and all Iron Work required for Building purposes" appeared in Trow's New York City Directory of that year. The other members of this firm were Allen Cameron and William B. Johnson. After Radley left they became Cameron & Johnson for a while, then later Johnson Brothers. For more on Johnson Bros. see their page in the manholes section. 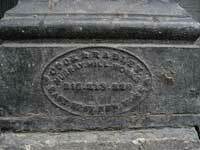 Cook & Radley came into being by 1867 and were in business until Radley's death in 1890. The foundry, located on East 37th St., was call the Murray Hill Iron Works. This ad dates from 1876. This one from 1878 adds 214 to the succession of addresses. A Cook & Radley cast-iron sidewalk basement entrance can be seen at 381 Lafayette St. This also includes 214 in the foundry address. The 1880 United States Census (non-population schedules) recorded Cook & Radley, Iron Foundry as owning $100,000 of real capital and $85,000 of raw materials. It employed as many as 105 workers and an average of 75 at annual total wages of $36,000, and that year it produced iron worth $156,900. The company paid $2.50 per day for skilled workers and $1.50 for an ordinary laborer. The foundry's power was supplied by one steam engine with one boiler producing 40 horsepower. Both Cook and Radley had sons that followed them in the iron business. In Cook's case there were two sons, Valentine Cook, Jr., and Martin Cook (1869-1948). Valentine Cook & Son continued under Martin Cook (and maybe Valentine Jr.) for a few years. Martin Cook was still involved in iron construction at the time of the U. S. Census of 1900, but the last "iron" entry for him in city directories is 1900. In the New York City Directory of 1903 both Cooks are identified as "glass" (importing?) at 1133 Broadway. John B. Radley's son, John Joseph Radley (1863-1935), however, followed iron (and later, steel) construction for many years. He established John J. Radley Iron Works at the old Cook & Radley site on 37th St, and then moved to 18th and 19th streets on the East River in 1894. This became the Radley Steel Construction Co., 624 E. 19th St., by around 1909. This lasted until around 1913, after which John J. Radley went into real estate. 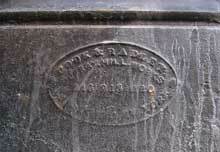 A founder's mark for John J. Radley & Co. can be seen at 362 West Broadway. 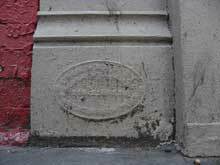 This mark bears the address 214-220 East 37th St., so it probably precedes 1894 in date. Another John J. Radley mark is found on East 77th St.. 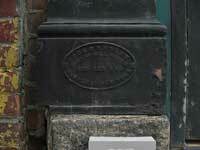 This one has the address 18th-19th St. East River, so it probably dates after 1894. Around 1901-1902 the Murray Hill Iron Works at 212 E. 37th St. was taken over by Francis L. Glessner, president, and Charles Hibson, treasurer. Other leadership seems to have taken over after these few years. The foundry on E. 37th St. continued in operation until around 1915/16. 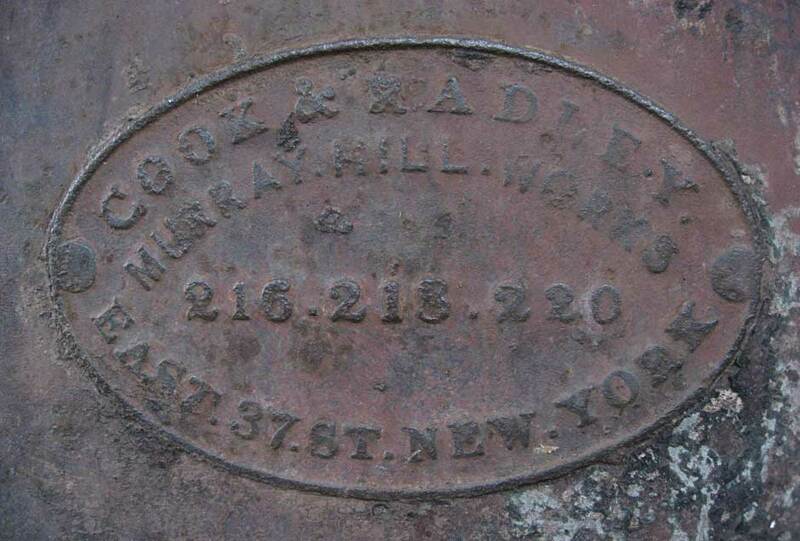 The Cook & Radley mark at 209 W. 28th St. does not have the usual oval shape and does not mention the Murray Hill Works. It simply reads "Cook & Radley / 214 to 220 E 37 N Y."